Throughout July and early August, Samford University will host send-off parties for incoming freshmen and their families, allowing them to meet other freshmen and families from their area. Samford staff members will also be available to answer any last-minute questions. This summer, send-off parties are scheduled in Atlanta, Austin, Birmingham, Chattanooga, Dallas/Fort Worth, Houston, Huntsville, Louisville, Mobile, Nashville, Newport Beach, Orlando, Slidell and Tampa. These events are helpful in building a Samford community away from the campus itself, according to Susan Doyle, office of family and parent program director. Students often meet each other and coordinate rides to and from home, delivery of packages and find a friendly face to smile at around campus. 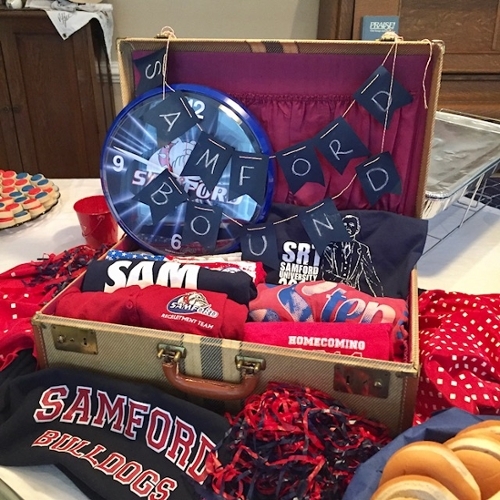 “Send-offs help new Samford families make connections with as many students and family members as possible so they all feel right at home when school begins,” Doyle said. These parties will be held in homes or event venues in the scheduled city. Samford President Andrew Westmoreland has also been known to make surprise visits in some cities, Doyle added. July 23, 7 – 9 p.m.
Aug. 4, 6 p.m. – 8 p.m.
Aug. 16, 6:30 – 8:30 p.m.
July 24, 7 – 9 p.m.
Aug. 5, 6 – 8 p.m.
Aug. 2, 7 – 9 p.m.
July 25, 6:30 – 8:30 p.m. The Hall at the Lumberyard, 611 Meridian St.
July 20, 6:30 – 8:30 p.m.
July 30, 6:30 – 8:30 p.m.
July 19, 6:30 – 8:30 p.m.
Noah Liff Opera Center, 3622 Redmon St.
Aug. 7, 7 p.m.– 9 p.m.
Aug. 9, 6:30 – 8:30 p.m.
July 31, 6:30 – 8:30 p.m.
Aug. 8, 6:30 – 8:30 p.m.
Tampa Bay Yacht Club, 5320 Interbay Blvd.